A few hours later than promised, this post is a Dystopian Wars scenario inspired by the Island and Harbour set available from Amera Plastic Mouldings, for a bargainous £10.50. Commodore Aldus Stone eyed the harbour through the viewing lens of the CSS History’s Judgement with contempt. The Britannian bastards had descended on the small island, wiped out the indigenous population and mined the mountainous slopes to create the harbour arrayed before the Covenant of Antarctica’s 5th fleet. Typically Brtiannic in design, it was crude dirty and over developed for its size. It’s location in the South Pacific made it ideal to launch launch raids against the Covenant’s waters or pick on trade routes in the area. Their arrogance sickened him and the tactical threat too great. Stone would not stand for it. In Harbour Assault the attacking side has discovered an enemy harbour and is intent on destroying it. The defenders must protect the harbour at all costs. This scenario is played across the length of the board, not the width and as such should be played over at least a 6ft by 4ft gaming board. 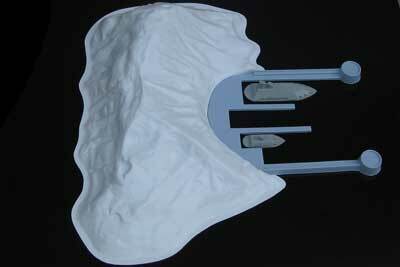 Arrange scenery as you see fit, but making sure that the island and harbour is at one of the narrow ends of the board. Feel free to place any other scenery you see fit. The defending fleet deploys first and must do so no further than 6 inches from the harbour. The defending player may choose to deploy some of their ships within the harbour. They will benefit from the sea walls and as such any shots directed at them suffer a -1 to hit to a maximum of 6 to hit. However, any ships wishing to move away from the harbour may only do so at 3 inches a turn until they are clear of the walls. The attacking force may deploy up to 10 inches from the opposite board edge. 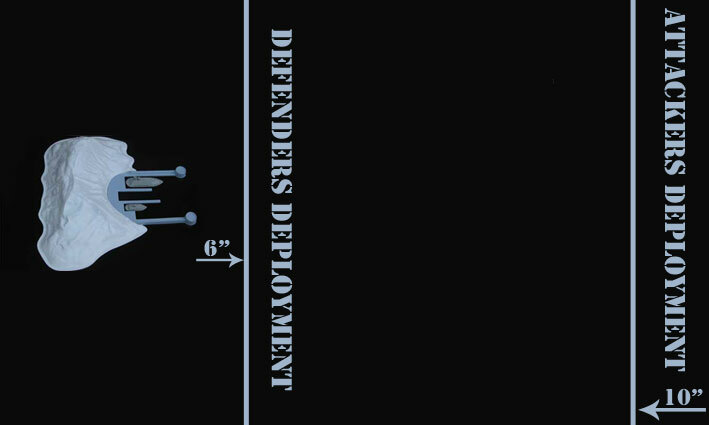 Although the attacking force has the element of surprise, the defending force are quick to mobilise. Both parties roll for initiative as normal. However for the first turn only the attacking player may add +1 to the roll. Depending on the size of fleet the turn limit will vary however 6 turns is a good place to start. The objective is simple. The attackers must destroy the harbour structures and defence turrets before the turn limit is reached. The defenders must protect the harbour at all costs. Providing a single structure (not turrets) is still intact when the turn limit is reached the defenders win – even if the fleet has been wiped out. The harbour has 3 structures and 2 defence turrets. The defence turrets may be anything of the defenders choosing using the entries provided in their relevant force lists. The 3 structures represent supply yards, storage facilities etc. however for ease of play they have the same DR, CR & HP as a defence turret. This sufficiently represents the durability of the structures built for such a harsh and exposed environment. If you’re playing a particularly large game it may be wise to find a larger harbour terrain piece with more structures and more turrets. Found this over on The Shell Case blog… I have that island, keen to give it a try!